Sorry for being such a cruddy blogger this week. 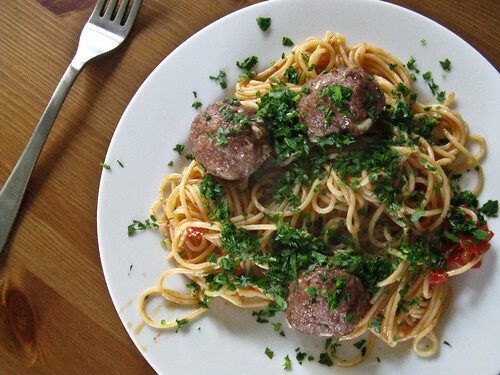 The above picture of spaghetti and meatballs is the only food photo I’ve taken in the past week – it’s kinda embarrassing. I made a really tasty Sichuan stirfry of green beans, pork and tofu a few days ago, but completely failed to document it. The mushroom lasagna and the roast chicken, while extremely delicious, have already been thoroughly blogged about. And last night I ate squid in tomato sauce, some sort of roasted meat and a yellow rice pilaf from a buffet in a retirement home (it was the kickoff party for an art show), and it seemed too strange to photograph. Sometimes you just have to put down the camera and pick up your fork.